With the promise of El Niño bringing milder and damper winter conditions, this might be a good year to try growing some winter vegetables in the warmer parts of Inyo and Mono counties. Choose your space. One of my problems is the fact that I tend to plant successions of vegetables all through the year, so I still have tomatoes, beets, parsnips, lettuce, peas, carrots and leeks taking up a lot of space! I also like to take the opportunity to leave most of the veggie plot fallow in order to cultivate it during the winter. Sometimes the areas that we choose for summer planting are not always the best ones to choose when growing in other seasons. Large open areas used in summer may well be subject to severe radiation frosts or drying winds in winter. Lower sun angles may mean that a spot that gets plenty of sun in summer might be too shady in winter due to a fence or other structure. Look around carefully to find a sheltered spot with the most light (especially if using frost-cloth tunnels which will reduce the light reaching the plants). However, those who live at high altitudes or in the colder parts of Inyo/Mono counties may be reduced to growing bean sprouts on the kitchen windowsill! Be practical. With irrigation systems turned off, and relative humidity low, one can expect to be doing a lot of hand watering. Take the distance from a faucet into consideration. As the worst of winter recedes, and the sun gets higher, it can get very hot under tunnels of frost cloth, and in cold frames and greenhouses, so it will be important to open them up to allow air to circulate during the day, a tricky problem if one is not on the property full time. Optimize what you have. If you have a greenhouse, this is the time of year when it can really pay dividends -one of our Master Gardeners picked ripe cherry tomatoes throughout last winter! However, if a greenhouse is not available frost cloth stretched over hoops of plastic or wire, or a hoop house, can still help modify soil temperatures to a greater or lesser degree. I make tunnels from 8' lengths of 3' or 4' wide field wire bent in half lengthwise with frost cloth stretched over and held in place with clothes pins - simple and effective. I find it easier to lift the whole tunnel off as a unit in order to tend the plants, rather than dealing with individual hoops. I have frost cloth, shade cloth and insect and bird netting cut to size so that I can cover the tunnel with what is most appropriate at any given time. High winds can shred plastic and blow mulch into the next county so make sure that covers are secure. Other suggestions regarding cold protection: for individual plants a large upturned, hanging basket stuffed lightly with straw, dry leaves or even crumpled newspaper can help (I have even used a shower cap over the basket to keep the mulch dry during rain). The basket prevents the mulch from blowing away or getting scratched up by animals. For tender herbs growing against a wall, I use old window fly-screen panels with frost cloth cut to size and attached to the frame by clothes pins. I then lean the tops against the wall making a warm tunnel underneath. I have used old storm windows in similar fashion but found that they made the plants a little too hot. Sturdy tomato cages, no longer in use at that time of year can be placed over plants with frost cloth wrapped around the outside, and the top protected by a stout piece of cardboard attached by clips or wires. Be vigilant about pest control: You may have found a nice cozy spot for your plants, but it is just as cozy for aphids, earwigs, sow bugs and caterpillars. I have seen cabbage white butterflies investigating my plants at the end of December! I also had to throw away several beautiful heads of broccoli one winter when they had the worst gray aphid infestation that I have ever seen. The infestation took hold during a cold spell when I had preferred to sit in front of a fire rather than caring for my plants – no amount of pressure hosing would remove the sticky mess! 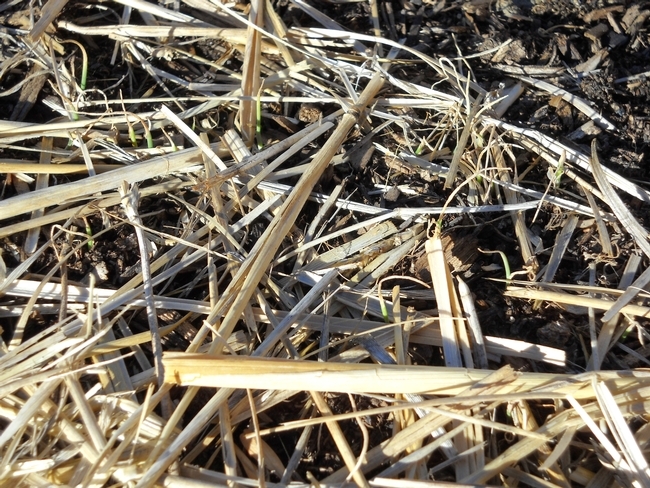 Soil preparation and sowing techniques are much the same for winter crops as for any other time. Plants should be mulched to reduce swings in soil temperature as much as possible, but of course this can only be done after seeds have germinated otherwise the tiny plants would risk getting smothered. Lettuce, radish, onions and spinach, radishes, fava beans, beets and chard may be sown as seeds. Garlic cloves can be planted until early November. Well grown starts of the cabbage family: Brussels sprouts, broccoli, and small varieties of cabbage together with kale. Although these are hardy and tough plants they need to be checked regularly for pests. Parsley is tough and I have seen it flattened by a thick covering of ice from a leaking gutter, but a few hours later it was standing as if nothing had happened. In the High Desert growing through the winter is always a risk and one's successes will vary from year to year but with good frost protection and possibly milder temperatures it might be worth a try, especially from Big Pine south.